New England needs more renewable energy. CMP project is part of the solution. Central Maine Power Co. proposes to build a 145-mile transmission line through western Maine. The project has the support of Gov. Janet Mills but faces opposition from numerous groups and communities. New England, along with the rest of the world, needs to reduce its emissions of greenhouse gases to stave off the worst consequences of climate change. To this end, Massachusetts has set stringent greenhouse gas emission reduction goals and accompanied them with regulations to dramatically increase renewable energy use. Hydro-Quebec says it can generate significantly more hydroelectric power from its dams than it currently does. It is actively seeking customers for that power. Hydro-Quebec and Central Maine Power Co. teamed up to develop a plan to get the Canadian hydro power to Massachusetts. The Bay State, after a plan to run a power line through New Hampshire was rejected there, chose the $950 million CMP/Hydro-Quebec bid to meet its renewable power standards. The question before the Maine Public Utilities Commission is whether the project, and its proposed 145-mile transmission line through western Maine, meet the standards for a certificate of public convenience and necessity. This requires an assessment of values such as economic and health consequences, electricity reliability and state renewable energy generation goals. After months of review and meetings, we believe the New England Clean Energy Connect project clears this hurdle. The CMP project offers a real opportunity to bring new renewable power to the New England energy market. That is a benefit to Maine. Our support, however, is not unconditional or without reservations. One of the most debated aspects of the project is whether it will reduce greenhouse gas emissions. Daymark Energy Advisors, a consultant hired by CMP, concluded in a 2017 study that the project would lead to greenhouse gas emission reductions of 3 million metric tons annually in New England. This is largely because electricity that is produced by burning fossil fuels, mostly natural gas, will be replaced with cleaner hydropower. Daymark also concluded that the project will save ratepayers up to $44 million a year in electricity costs, in part by reducing the state’s dependence on natural gas and its price volatility. 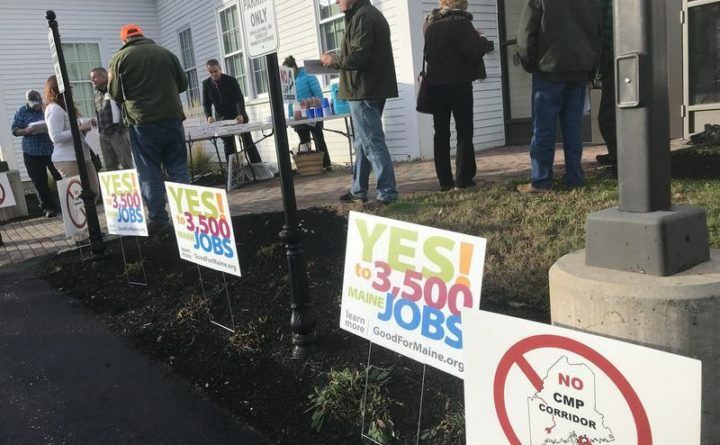 It is worth remembering that Maine still has a plan on the books, approved by the utilities commission in 2016, to spend up to $75 million a year in Maine electricity ratepayer money to build pipeline capacity to bring natural gas, much of it produced by fracking, into New England to produce electricity. Having Massachusetts cover the entire cost of a transmission line through Maine to bring hydropower to the New England electricity market makes much more sense. Critics of the project argue that there won’t be emissions reductions from the NECEC project because Hydro-Quebec will divert electricity it currently sells to other U.S. and Canadian customers to the new line, leaving these customers to turn to other, dirtier sources of power. This can’t be ruled out, but given greenhouse gas reduction requirements throughout the northeastern U.S. and Canada, and Hydro-Quebec’s stated excess generating capacity, we are satisfied that it is unlikely. We are, however, concerned that the project will depress the demand for renewable energy development in Maine. But that concern is outweighed by the fact that the CMP project is in front of us right now, rather than a theoretical project that may or may not materialize in the future. Of course, both CMP and Hydro-Quebec stand to make a lot of money from this project. And, to put it mildly, CMP has significant public trust problems because of billing errors and its response to power outages. But this decision isn’t about rewarding or penalizing these companies — it’s about assessing an energy opportunity for Maine. We believe that the utilities commission was likely to approve the project even before the addition of a negotiated benefits package. Though it isn’t as large or as targeted as it could be, that package is a positive outcome for Maine. The $258 settlement agreement includes $190 million to reduce electricity rates in Maine, with $50 million direct toward low-income consumers. The individual savings will be small, but this is in addition to the other, larger benefits of the project. The agreement also includes $15 million for heat pumps, $15 million for electric vehicle infrastructure and $15 million for broadband expansion, in addition to other payments to communities and educational institutions. The settlement agreement helped the project win the endorsement of Gov. Janet Mills — who mishandled an announcement of her support and helped to fuel perceptions of “backroom” dealings but nonetheless reached the right conclusion — along with securing support from other groups, including the well-respected Union of Concerned Scientists. The project has to clear many regulatory hurdles — both in Maine and Massachusetts — before it can become reality. Each hurdle comes with complex, and contentious, debate about its benefits and negative consequences. For example, the Maine Department of Environmental Protection will weigh the project’s impacts on wildlife habitat, water quality and other natural resources. Those assessments must be thorough and inclusive of local concerns. For us, an overriding concern is ensuring that new large sources of clean, renewable energy are brought to the New England market. The NECEC is one part of this puzzle.